Diploma, Saint Luke’s College of Health Sciences, Kansas City, Mo. BSN, Northwest Missouri State University, Maryville, Mo. MS(N),University of Missouri, Columbia, Mo. DNP, Rush University, Chicago, Ill.
Dr. Mary Beck professional experience started in critical care nursing in rural Missouri and evolved to include critical care educator. 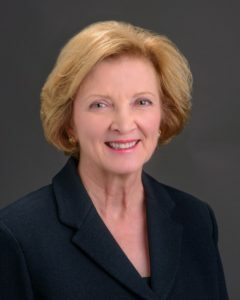 She has also held numerous leadership roles culminating with 16 years as Vice President Patient Care Services and CNE of Boone Hospital Center in Columbia, Missouri. She led the hospital to achieve Magnet designation for nursing service excellence three consecutive times. Dr. Beck transition from full-time Assistant Teach Professor of the SSON to the Chief Nursing Officer of MU Health Care in September 2017. Beck, M., Doscher, M. Effects of Patient Care Unit Design and Technology on Nurse and Patient Care Technician Communication. Journal of Gerontological Nursing. April 2018. Beck, M., Staffileno, B. Implementing Evidence-Based Practice During an Economic Downturn. Journal of Nursing Administration, July/August 2012. Popejoy, L., Beck, M., Antal, L. Intensive Care Unit Nurse Perceptions of Caring for the Dying: Every Voice Matters.Journal of Hospice & Palliative, May/June 2009. Lower, M.S., Nauert, L. Charting: The Impact of Bedside Computers. Nursing Management. July 1992. Watson, P., Lower, M.S., Wells, S., Farrah, S., and Jarrell, C. Discovering What Nurses Do and What It Costs. Nursing Management. May 1991. Geden, E.A., Lower, M.S., and Beattie, S. The Effects of Music and Imagery on Physiologic and Self-report of Analogued Pain. Nursing Research. January/February 1989. Porter, R.T., Porter, M.J. and Lower, M.S. Enhancing the Image of Nursing. Journal of Nursing Administration. February 1989. Scott, S., and Lower, M.S. Image of Nursing: Perceptions of Nurses, Physicians and the Public. The Missouri Nurse. December 1988. Beck, M. (2015, May). Strategic Quality 101: “How to Engage Frontline Stakeholders in Quality,” Missouri Hospital Association, Columbia, Missouri. Beck, M. (2014, January). “Diversity in Nursing in Missouri,” Missouri Action Coalition, Jefferson City, Missouri. Beck, M. (2013, April). “Expanding Nurse Clinical Decision Making with the HOUDINI Protocol,” Webcast, The Advisory Board Company. Beck, M. (2012, October). “BJC Response and Actions to Institute of Medicine (IOM) Future of Nursing Report,” 2012 BJC Nurse Leadership Conference, Christian Hospital, St. Louis, Missouri. Beck, M. (2012, March). “Embracing Patient Centered Care in Designing a New Patient Bed Tower,” Alpha Iota Chapter of Sigma Theta Tau, General Membership Meeting, Columbia, Missouri. Beck, M., DNP, RN, NE-BC, Smith, M., APRN, ACNS-BC, Schuenemeyer, N. RN, Co-authors. (2011, November). “A Community Hospital’s Innovative Approach to Enculturating Evidence Based Practice,” Poster Presentation, 16thAnnual Midwest Regional Nursing Educators Conference, Columbia, Missouri. Beck, M. (2010, September). “Nothing About Me Without Me: Success Strategies for Design With Owner Teams,” Healthcare Facilities Symposium and Expo, Chicago, Illinois. Beck, M. (2009, November). “Strengthening Linkages in Nursing Education: Connecting Practice-Based and Academic Nursing Educators,” participant of the Moderator Respondent Panel, 14th Annual Midwest Regional Nursing Educators Conference, Columbia, Missouri. Beck, M. (2008, April). “Creating a Culture of EBP,” Round Table Discussion Facilitator, MU Sinclair School of Nursing, Nursing Outreach and Distance Education, Building a Culture of Quality, Safety and Nursing Professionalism: Evidence-Based Practice on the Frontline Conference, Columbia, Missouri.